and security that only a Seating Matters chair can provide. 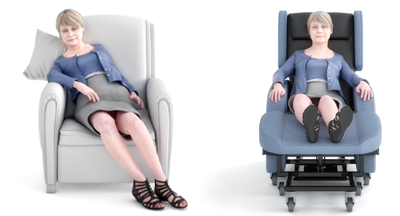 The Atlanta™ is successfully used in the management of lower limb oedema. The variable angle leg rest used in combination with the integrated tilt and recline helps to elevate the feet higher than the heart which is the optimum position for fluid drainage. Individuals with tight hamstrings and contracted legs can also be accommodated due to the negative angle clearance underneath the seat which allows the feet to retract behind the knee without compromising the person position in the chair. Margaret, 81, had a history of pneumonia and had recently suffered a stroke (CVA). She also had a high risk of pressure injuries and needed pain medication when sitting out. Following assessment, Margaret was sat in the Atlanta chair and was much more comfortable. She no longer required pain medication whilst sitting in her new chair. Lower limb oedema and swelling. Risk of falling or sliding from chairs. A one piece footplate to support the person’s feet during transfers or during rest. This can be safely retracted underneath the seat when not in use, eliminating any tripping hazard. For more in-depth information on all the ATLANTA™’s features, dimensions and specifications, please feel free to download the operational manual.